Spinach and egg whites get rolled up into a portable breakfast wrap. This is a sponsored post written by me on behalf of AllWhites Egg Whites for IZEA. All opinions are 100% mine. Although I follow a plant-based diet, there are times my family and I feel like we need a protein boost. In those times I often turn to eggs as they are a meatless, high protein food. As I mentioned a few posts back, my hubby and I are both training right now (him for cycling 100 miles, and me for a half-marathon). While we are burning off so much energy, it’s important to refuel with a lot of delicious balanced foods. Today I made these egg white wraps packed with fresh spinach, feta cheese, and tomatoes. 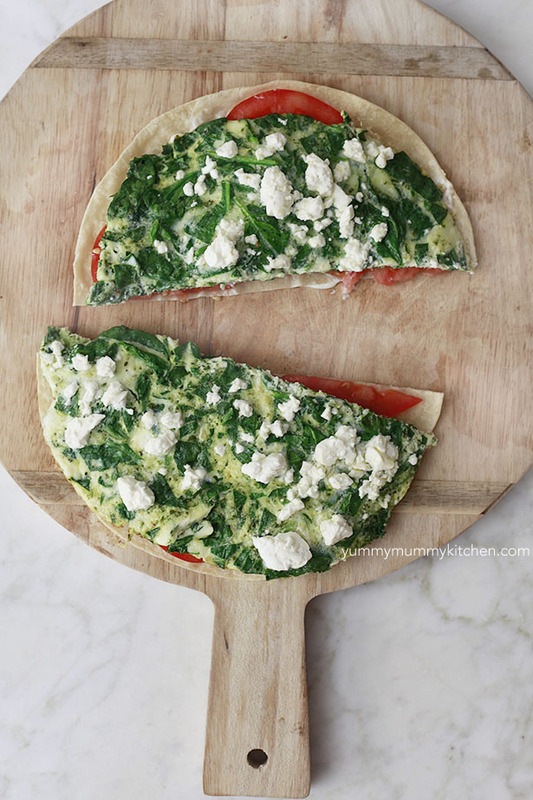 Spinach and feta is one of my favorite flavor combos and reminds me of some of my favorite Greek foods. Adding pesto to eggs is such a simple way to make them incredibly flavorful. I don’t know why I don’t always add pesto to my eggs! I added a few fresh basil leaves at the end for even more fresh flavor. These wraps are flavorful and filling – perfect for building lean muscle after a workout. Here’s how to make them. I prefer egg whites because they are just a bit lighter than whole eggs. Today I used AllWhites Egg Whites because it’s a quick and easy source of protein. Unlike some other brands, it’s 100% egg whites. They are also naturally fat-free and cholesterol-free, and located in the refrigerated dairy section. 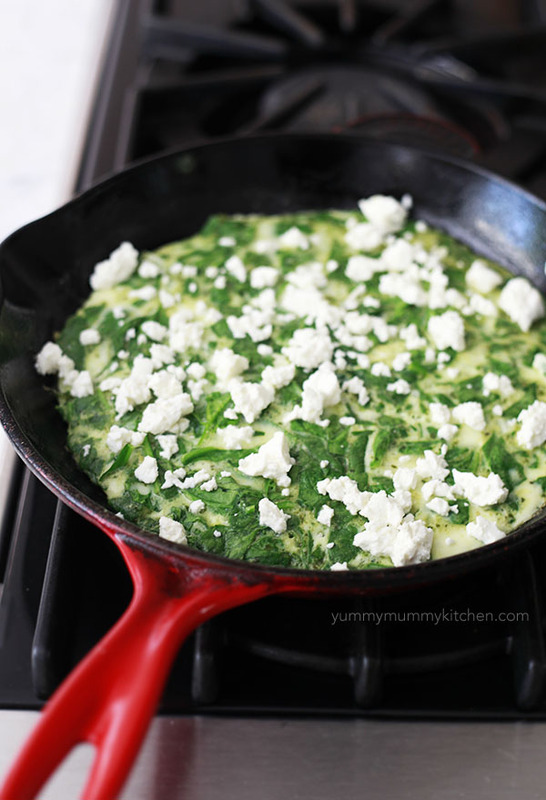 Add 1 cup of egg whites to a greased skillet and stir in chopped fresh spinach. Let that cook and then sprinkle feta on top. Top a whole wheat wrap, gluten free wrap, or tortilla with sliced tomatoes and your spinachy egg and wrap it all up! Voilà – an easy, portable, meatless, protein-packed breakfast, lunch or dinner. Spinach, egg whites, and tomatoes come together for a delicious high protein breakfast. Coat a skillet with cooking spray and place over medium heat. 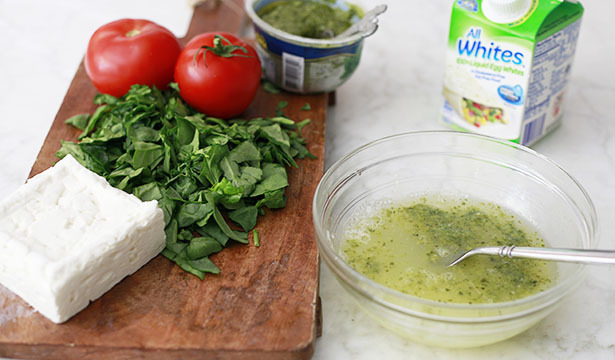 Beat egg whites with pesto to combine. Pour into skillet and stir in spinach. Cook until eggs are cooked through but still moist and soft. Sprinkle with feta, cover, and cook one minute longer. Spread mayo on flat breads. Arrange tomatoes on top. Cut egg mixture in half and place over the tomatoes. Roll up and enjoy!